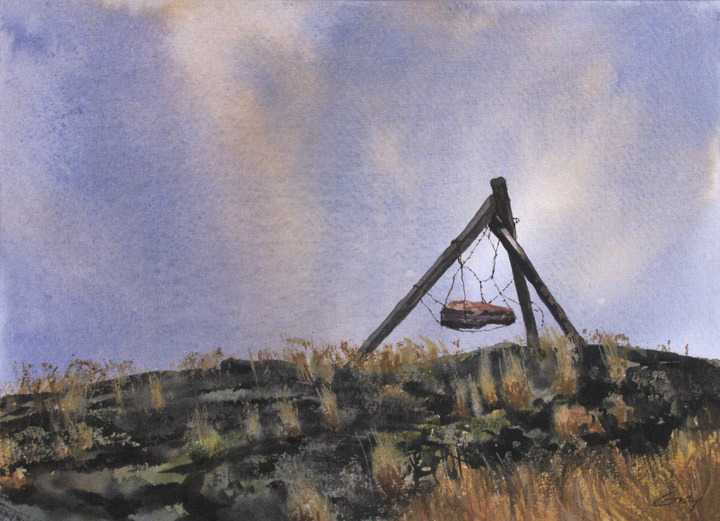 Watercolor on archival paper, 7 1/4" x 10"
OK class, time for another Gray tutorial on eastern Oregon fence building. Here's a variation on the rock jack (see my April 28th post.) This style of jack may have another name, but I don't know it. (some fencing instructor I am, huh?) Maybe some of you ranchers can help me out. It's a pretty elegant, simple solution that looks almost sculptural, don't you agree? This subject seemed to cry out to be painted in watercolor, at a bit larger scale than the usual daily. I love this one! The sky is lovely and I like the way the orange grass contrasts against it. A stark yet beautiful lesson in basic physics. Love the sky and the rock "hanging in the balance." Thanks a lot, Kristin--nice to hear from you. Hi Anne--thanks. Yes, it really is elemental physics. 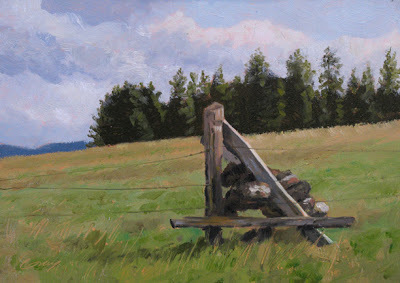 One senses the weight of the stone and how it effects the tripod of posts. "Rock Cradle" may not be the official name, Micah, but I think it's a perfect description! Thanks. That lone structure is a fence? But what is it blocking out? Or was it part of a fence that's been dismantled? I like the starkness of this painting. Very Wyeth. ya know...there is something strangely beautiful about this structure. It has been dismantled, Dean. Normally there would be 4 or 5 strands of barbed wire strung across one of the angled posts. The wires end up being not vertical but angled. They are a bear to try to cross without getting your clothes hooked on the barbs! Thanks, Mary. Wyeth was my big idol as a young painter--I even flew from Oregon to Pennsylvania to meet him and ask his advice on whether I should try painting full-time. All these years later, when I use watercolor I tend to "revert" to a more Wyeth-like style--can't seem to help it. It is beautiful, isn't it, Micah? I love your term "rock cradle."